In a career spanning seven decades, Frank Lloyd Wright built over five hundred buildings, and changed the face of modern architecture. Fallingwater, the house over the waterfall, has been called the greatest house of the twentieth century. 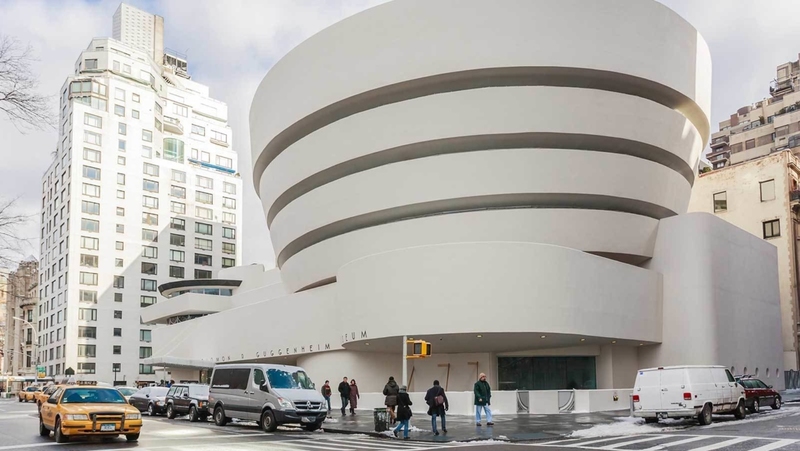 The spiraling Guggenheim museum in New York reinvented the art museum. But the underlying philosophy that links all Wright’s buildings is as important as anything he built. Those ideas were rooted in the Welsh Unitarian religion of Frank Lloyd Wright’s Welsh mother. She was born and raised near Llandysul in west Wales, and emigrated to America with her family in 1844, most likely to escape religious persecution. Her son, Frank, was raised in a Unitarian community in Wisconsin, a small piece of Wales in America. The values he absorbed there were based on a love of nature, the importance of hard work, and the need to question convention and defy it where necessary. Wright’s architecture was shaped by these beliefs. Frank Lloyd Wright built his lifelong home was in the valley he was raised in, and he named it after an ancient Welsh bard: Taliesin. It was the scene of many adventures, and of a horrific crime. In 1914, a servant at Taliesin ran amok and killed seven people. They included Wright’s partner, Mamah Cheney, and her two young children. A hundred and fifty years after his birth, Jonathan Adams argues that Frank Lloyd Wright is now a vitally important figure who can teach us how to build for a better world. Wright’s belief in what he called organic architecture - buildings that grace the landscape and respond to people’s individual needs - are more relevant than ever, in Wales and around the world.